This Sea Ray Express 340 was built for speed and comfort. Designed to keep you dry in any condition with her fully covered cockpit Canvas. 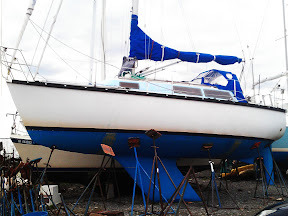 Built to be the most spacious and accommodating 28 foot sailboat on the market. Designed with 21st Century computer-modeling techniques, this yacht meets all the requirements of an ocean-cruiser. New Awlgrip, Electric Winch and Windlass, Esper Heater, SeaFrost Refrigeration, Swim Platform, New Dodger and Sun Shade. For the sailor who appreciates only the best quality and workmanship, along with a high- performance rig. Comfortably make passages that would be feared on lesser boats. Equipped with Wheel-steering Auto-pilot, solid Boom Vang, your destination has no limit. This boat is a fast, Racer Cruiser. William Shaw design, this boat is in gorgeous condition, with a recent Awlgrip top-coat paint job.